Spray 5-quart slow cooker with cooking spray. In small bowl, mix taco seasoning mix, cumin, salt and red pepper. Sprinkle both sides of chicken thighs with seasoning mixture; arrange in slow cooker. Pour tomatoes, beans and corn over chicken in slow cooker. Cover; cook on High heat setting 2 to 2 1/2 hours or until juice of chicken is clear when thickest part is cut (at least 165°F). 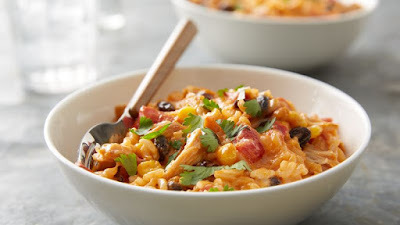 Remove chicken and, using two forks, shred into bite-size pieces. Add Velveeta™ and Cheddar cheeses to slow cooker. Cover; cook 15 minutes. Beat with whisk until cheeses have melted into sauce. Add rice and shredded chicken; stir to combine. Cover; cook about 10 minutes or until hot. Garnish with cilantro.